We are Stephen and Weiwei. 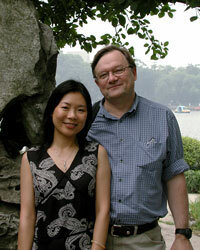 We met and fell in love in Guilin, China while Stephen was on a job assignment in 1997. Over the next few years our relationship deepened and we decided to get married. After overcoming the numerous bureaucratic hurdles, Weiwei came to the US and we were married. In year 2003, we were on another job assignment in Louisville, Kentucky, and saw some Jinshan Peasant Paintings for the first time at an Asian Art Fair. We were amazed by the bright colors and vivid depiction of daily life in rural China. All we knew was that the paintings were from a place called Jinshan, somewhere in China and we wanted to own a few. On our next trip to China we were determined to find Jinshan. As luck would have it, we were staying in Shanghai and we found out that Jinshan is a district of Shanghai. We went to the Jinshan Peasant Painting Academy and met the vice dean of the academy Mr. Zhu who was also a painter, he was very glad that we liked Jinshan Peasant Paintings, and authorized us to promote the sales. We visited Jinshan Peasant Painting Academy three times since then, and every time we brought back more beautiful peasant paintings. We continue to travel to China for business and to visit family and we always look for new examples of folk art to add to our collection and to this Web site. In the future we plan to add some new sections with the new treasures we find.